Knockoff sunglasses are a rush. You're walking down the boardwalk when you spot a pair of orange Ray-Bans on one of those spinny displays, under a cardboard sign that says $15. For Ray Bans? No way. You make your husband stop, even though you promised him the next stop would be lunch, and you hurry over because there's a woman in a tie-dye shirt milling around and you don't want her to nab them. You quickly plant them on your eyes like a pioneer woman staking her claim. They feel good -- exactly like Ray Bans. Or so you imagine -- you've never actually owned a pair. You love the Ray-Ban look and all your friends have them but they're so expensive; and you lose sunglasses so often, it's not worth the risk. But no risk here -- only $15! "That's lunch," your husband mumbles under his breath, probably just to make you feel guilty for your broken lunch promise. You check the glasses out in the display's smudged little mirror, forced to duck down because those mirrors are always waist-high for some reason. On cue, the tie-dye-shirted lady spins the display -- probably just to spite you because she secretly wants your pair -- and you shuffle in a circle, trying to keep pace with the mirror, turning your head left and right to check how they look from the side. They look good. They look great. You'd like a little more mirror time, but you're getting dizzy. You turn to the salesman, who's sitting on a stool, half-asleep, his toupee fidgeting in the breeze. "Are these Ray-Bans?" you ask, and he wakes up and hurries over and tells you "yes" and says he has many more colors and says they're very durable and says, "for you, two for 25," then recommends an ugly leopard-spotted number as your second pair, which hurts your feelings a little and makes you second-guess the Ray-Bans. So you ask your husband what he thinks, and he says "They're great," but you know he isn't paying attention because he's checking the price tag on one of those ironic t-shirts with 6-pack abs. It's up to you. You do a closer inspection. There's a 100 percent UV protection sticker on the lens, which seems promising, but so was that sushi place with the A-rating that gave you food poisoning two years ago. You lift the glasses up and study the logo closely, like a scientist examining the veins of a leaf. And there, right where it should be, is the cursive R, A, Y, space, B, A, N, D. Wait -- Ray-Band? Well there's your answer. What a letdown. But they felt so good. And they looked great. And you found them. All the other tourists passed right by. You've grown attached to these little orange Ray Bands, just like Charlie Brown to his Christmas tree. You turn back to the salesman, who's still trying to sell you on the leopard-spotted pair. "Five dollars for the Ray-Bands," you tell him sternly, emphasizing the d in Band. He calls you crazy and throws up his arms, knocking loose his toupee, then he reminds you of the quality and you can tell he's fighting back a smile because he loves this game. "10" he says. You bet you could get 8 but agree to 10 because you like this guy, and his toupee, and this day, and tie-dye lady, and your husband's stupid shirt, and this breeze, and most of all, your little pair of orange Ray Bands. "Bag for 10 cents?" the salesman asks you and you tell him no way. You're wearing these out. 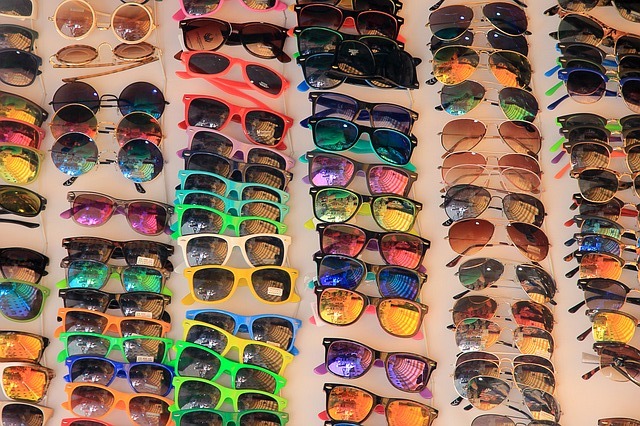 Eye Doctor's Postscript: It's long been said cheap sunglasses lack sufficient UV protection. My colleagues and I decided to conduct a study (excerpted in this August's issue of Redbook). We went down to Venice Beach, the cheap sunglasses capital of the world, and bought sunglasses labeled with 100 percent UV Protection. We tested the glasses and found even the cheapest pair provided sufficient UV protection -- meaning, if there's a "100 percent UV sticker," rest assured. For optimum protection, use wraparound glasses, so the sides of your eyes are covered. Keep in mind darkly tinted lenses aren't any better at blocking UV rays, so choose any lens color you like. And most importantly, always wear a pair outdoors, even on cloudy days.